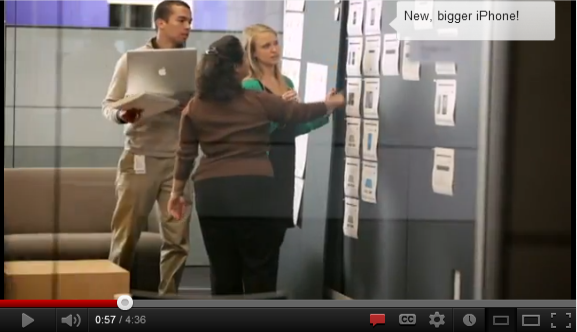 Can You Spot the 7-inch iPad in Apple's Corporate Recruitment Video? Can you see any secret products in this Apple corporate recruitment video? We’ve seen Apple’s recruitment videos for its retail stores in the past, but what looks to be an authentic corporate recruitment video has been found and published by 9to5Mac. A range of employees, notably including Joel Podolny, VP of Human Resources and Dean of Apple University, appear on the 4 minute video, which also includes Japanese and Spanish-speaking staff. Most interestingly is the possibility that the video has exposed a couple of internal secrets. At 0:57, a wall of mock-up shots contains what could be interpreted as the design for the rumoured smaller iPad/larger iPhone, as below. YouTube comments are also asking what size the iPad shown at 3:05 is – though it looks like a regular sized new iPad to us. Take a look and see what you can find. We’re keeping an open and undecided mind on this, for now.